I’m expecting this one to be everywhere in the media. The former first lady tells her story. The artist formerly known as ‘Scary Spice’ tells all in this no holds barred biography. “As one-fifth of the iconic Spice Girls and judge on The X Factor and America’s Got Talent , Melanie Brown, a.k.a. Scary Spice, has been an international star since her twenties. Brutally Honest is an exposé of the struggles and acute pain that lay behind the glamour and success. “When The Silk Roads was published in 2015, it became an instant classic. A major reassessment of world history, it compelled us to look at the past from a different perspective. “ The New Silk Roads brings this story up to date, addressing the present and future of a world that is changing dramatically. 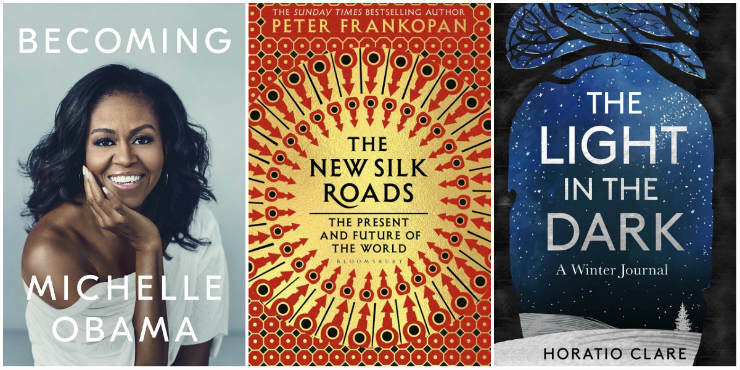 Following the Silk Roads eastwards, from Europe through to China, by way of Russia and the Middle East, The New Silk Roads provides a reminder that we live in a world that is profoundly interconnected. “As November stubs out the glow of autumn and the days tighten into shorter hours, winter’s occupation begins. Preparing for winter has its own rhythms, as old as our exchanges with the land. Of all the seasons, it draws us together. Latest book from music journalist David Hepworth. As always it is well informed with obscure things you never knew about even the biggest star names. The last essay is ‘Five records that always work at weddings’. “What’s fascinating about pop is our relationship with it. This relationship gets more complicated the longer it goes on. It’s been going on now for 50 years. David Hepworth is interested in the human side of pop. He’s interested in how people make the stuff and, more importantly, what it means to us. An investigation into what fascinates us about the small world – model railways, doll’s houses and even flea circuses. From the author who brought us the unlikely bestseller Just My Type (about fonts). Latest biography of Framlingham’s finest. The latest book from former Meet the Author subject Tracy Borman. “Henry VIII is well known for his tumultuous relationships with women, and he is often defined by his many marriages. But what do we see if we take a different look? When we see Henry through the men in his life, a new perspective on this famous king emerges. The first book from Sir Bradley since his retirement. This is a personal collection of his favourite riders and includes exclusive items from his own collection of memorabilia. Anyone who has done any type of management training will have read Who Moved My Cheese? The author of the book died recently but before he died he delivered his sequel featuring old favourites Hem and Haw.